"The finest Die-cast scale model collecting experience in the Midwest"
Hit the "Club Models For Sale" button above to order rare Fundraiser models exclusive to the club. !!! 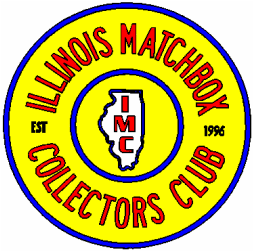 The Illinois "Matchbox" Collector's Club is a non-profit club based in the state of Illinois to promote collecting of "Matchbox" toys of all series. We have members from all over the world! The club publishes six magazines per year, holds bi-monthly meetings and swap meets usually at homes of collectors, allowing us to view each other's collections and discuss the hobby. Do you have a collection that you want to sell? The club has a number of options that we can discuss to help you sell your "Matchbox", Corgi, Dinky, Hot Wheels, Johnny Lightning or other toy collection. Please contact us for details. The club is also involved with charity work with the Pediatric Oncology Treasure Chest Foundation and the Cystic Fibrosis Great Strides program. Membership in the club is $20.00 per year for members within the United States, and $25.00 U.S. per year for members outside of the United States. Membership includes six "Matchbox" magazines delivered to your home as well as other offers that are provided to our club directly from "Matchbox" including the annual 1-75 catalog/poster. You are also eligible to obtain a free "Matchbox" model just for signing up. The free model is a 1957 Chevrolet produced by “Matchbox” with Rubber Tires and special Detailing. Supplies are limited, so if we are out of stock of the 1957 Chevy we will substitute another equally rare model in its place. You can pick up your free model at the next club meeting or have it mailed to you for an additional charge of $8.00 to your $20.00 membership fee. This offer is good while supplies last. If we run out of this model, another model will be substituted. Go to the "Download File" Link below and execute the "Print" command from your computer if you wish to have a hard-copy membership application to mail to us. We also accept electronic copies of the application.